Here’s a fruit that tastes like a sweet-and-tart spearmint candy! This is feijoa (which I pronounce ‘fay-JOE- ah’), and it comes from South America. This plant actually produces two edible treats: in spring it flowers, and you can eat the flower petals – they’re sweet, fleshy, and deliciously edible. Then in fall those flowers have turned into these lovely fruits, which rain down from the plant if you shake it. To eat, you cut through the leathery rind, and scoop out the delicious sweet flesh within. These grow on a shrub, which handles much colder winter temperatures than most “tropical” fruits, down to 12F (-11C). People grow these as landscape shrubs around here, enabling us fruit hunters easy foraging. People grow feijoas commercially for their fruit in California, New Zealand, and Israel. Sometimes people call these ‘pineapple guavas’, but I try to avoid using that name, because people inevitably shorten it to just ‘guava’, and they’re not guavas. They’re in a different genus altogether from true guavas (same plant family). And ‘feijoa’ is such a pretty name, don’t you think? Feijoa season is in autumn, so look for them in fruit markets, or if you’re in a warmish climate, you might find them in a landscape in your neighborhood. Cherry of the Rio Grande is a great “cherry” for Florida. This species has a sweet fruit very similar in flavor and appearance to a northern cherry, but this a tropical fruit in the guava family that grows well in Florida (and other warm-climate regions). The plant is an attractive evergreen shrub that grows to around 15 feet tall, and it can handle freezing temps down to 20F (-7C). Since it ripens its fruit in spring, which is normally the dry season in Florida, regular watering during that springtime dry period helps it set a full crop. I once brought a basket piled piled high with these to a spring potluck, and they got eaten fast. Everyone asked, “Where can I buy these fruits?” I answered that nobody sells them that I know of, if you want to eat them you’ll have to grow them yourself. Australian beach cherries, fruiting in my greenhouse. Also called Cedar Bay Cherry, this species is reported to be be nearly ever-bearing on mature plants. My plant is only about a foot tall, and it’s been popping out a few fruits sporadically, but that’s been enough for me to conclude that the flavor is excellent. I look forward to having these in near-continuous production as my plant matures. This one is part of the wonderful Eugenia group of tropical ‘cherries’. It used to be Eugenia carissoides, but it’s been reclassified as Eugenia reinwardtiana. A friend has one in a seven-gallon pot in his greenhouse, and it has fruit most of the year. Grumichama has a flavor closely approximating that of Northern true cherries, except for a slight bit of the resinous flavor that is characteristic of Eugenia fruits. Fruit quality varies considerably from tree to tree. Trees can fruit several times a year. Grumichama fruits develop very rapidly, going from flower to ripe fruit in just four weeks. Grumichama can produce fruits growing in a large container. Yellow and purple forms exist. The purple probably have higher levels of healthy antioxidant pigments, but the yellow ones reportedly are less subject to bird damage. Surinam cherry is probably the most widely-grown tropical “cherry” in the genus Eugenia. Native to South America, this species is now grown as an ornamental and edible in warm climates around the world. The plant grows as a shrub to small tree, and is often used for hedges. Fruits on landscape Surinam cherries are usually red, and flavor on fruits from these landscape plants varies from good to mediocre. Selected, named varieties of Surinam cherry have much larger, tastier fruit, and are propagated by grafting. Many of the best quality selections of Surinam cherry have black fruits. Presumably these have higher levels of antioxidant pigments, and so are even better for health than the average landscape Surinam cherry fruits. Cattley guava comes into two colors, red-fruited and yellow-fruited. Sometimes the red ones are called strawberry guava, and the yellow are called lemon guava. The picture is a tree at Fruit and Spice Park that has larger, tastier fruit than other yellow Cattley guavas I’ve had, almost as big as a small tropical guava, and they were supremely delicious, with a wonderful ‘tropical’ aroma and flavor. Cattley guava can handle more frost than tropical guava (Psidium guajava), down to at least 25F (-4C). Common guava, or tropical guava, is the guava that people in warm climates around the world know and love. Growing on a small, productive tree, these fruits have a creamy textured flesh that is white, yellow, or red, depending on the variety. Some kinds of guava have a powerful fragrance, which tropical fruit enthusiasts, including myself, absolutely love. I have on occasion held a container of guava fruits, just drinking in that intoxicating tropical fragrance. 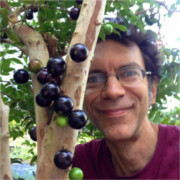 Jaboticaba fruits have an usual growth habit: they sprout right out of the trunk of the tree, looking like purple-black grapes stuck onto a tree. And they taste a little like a grape, except ….better. All kinds of complex, hard-to-describe tropical flavors dance on your tongue when you eat these. Wildly popular in its homeland of Brazil, jaboticaba for some reason is little-known outside that country. I predict a popular future. My tree made its first few fruits last year, and has a larger crop now, but this is only the beginning. In a few years, it’ll have so many fruits you won’t even be able to see this tree trunk – it’ll look like a column of black grapes. 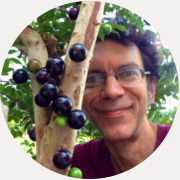 Jaboticabas have the fastest time from flowers to fruit of any tree I know – I’ve seen a jaboticaba flowers turn into delicious ripe fruit in 31 days. This purple type, known as ‘sabarah’ was the first type widely distributed in the United States from Brazil. It was erroneously labeled Myrciaria cauliflora for years, but it is actually Myrciaria jaboticaba. The true Myrciaria cauliflora is the ‘red jaboticaba’ described below. Red jaboticaba reportedly can make crops as many as six times a year, with delicious grape-lake fruits that sprout right out of the trunk. It also comes into bearing at a younger age than regular jaboticaba. Jaboticaba can handle freezing temperatures into the 20s. Myrciaria spirito-santensis is known as Grimal jaboticaba among fruit growers in the US, because it was originally introduced here by the late Adolph Grimal of Big Pine Key in Florida.